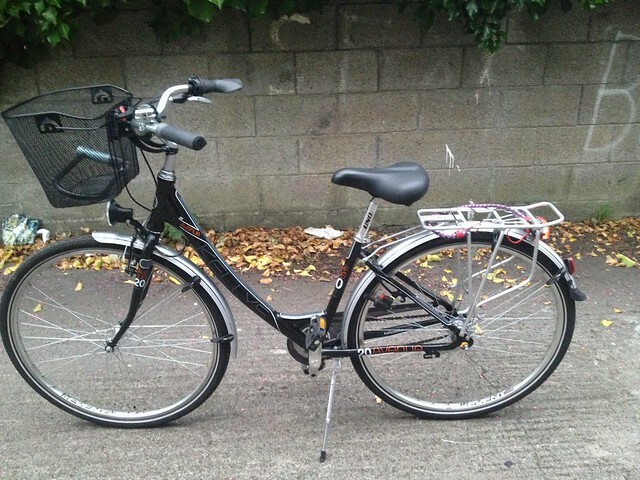 The first fancy bike I got when we moved to Dublin in 2008 was stolen. My sister gave me her old bike to replace it and it served me faithfully for a number of years but it was showing signs of wear and the back wheel was buckled by opportunistic thieves (who didn’t get it) and straightened (by a passing French tourist who took pity on me) and still wobbled. And the gears were shot. And it was designed for a flat country (it was my sister’s bike when she lived in the Netherlands). And I cycle every day around town and I felt it was time. Here is a picture of my new bike; taken partially for this blog and partially so that I can use the picture to try to retrieve it if stolen. A lovely bicycle indeed, I hope it serves you very well. Thank you very much. Am really hoping that I don’t need to use this photo, if it’s stolen. Hooray for a new bike. I hope you have also made a note of (and registered) the frame number. Um. No but now I will.